Indications for nephron sparing surgery are expanding. In approach to partial nephrectomy, open surgery is still the gold standard. Laparoscopic approach is applied only in carefully selected patients. This method is more challenging, with a higher percentage of complications, however, it is expanding. The incidence of kidney tumours in Czech Republic is the highest in the world. In 2005, it was in male 34.9 and in female 19.3 cases in 100.000 per year. Owing to this fact, urologists in Czech Republic are focussed on surgery of kidney tumours. At our department, we treat over 150 patients with kidney tumour surgically every year. 1. Expansion of indications for nephron sparing surgery. 2. Less invasive techniques—laparoscopy and robotic surgery. 3. Ablative techniques. Of course, a lot of new technologies and methods are under investigation but they are still experimental and are not topics of this article. 1. Frozen section has minimal clinical significance. 2. For surgical margin—minimal layer is enough. 3. Enucleation has a high risk of incomplete excision. Nephron sparing techniques are not more expensive, oncological results are good, but patients profit a lot from saving of both kidneys. Laparoscopic Radical Nephrectomy (LRNE) in clinical stages T1-2N0M0 is from oncological point-of-view equivalent of open nephrectomy. Radical laparoscopic nephrectomy is accepted even in the EAU (European Association of Urology) guidelines as the gold standard for tumours T1-2. And skilled surgeons are able to perform this procedure in advanced cases as well (category T3a-b, N+ = positive lymph nodes). These advanced cases need careful individual assessment of case with respect to skills of surgeons. 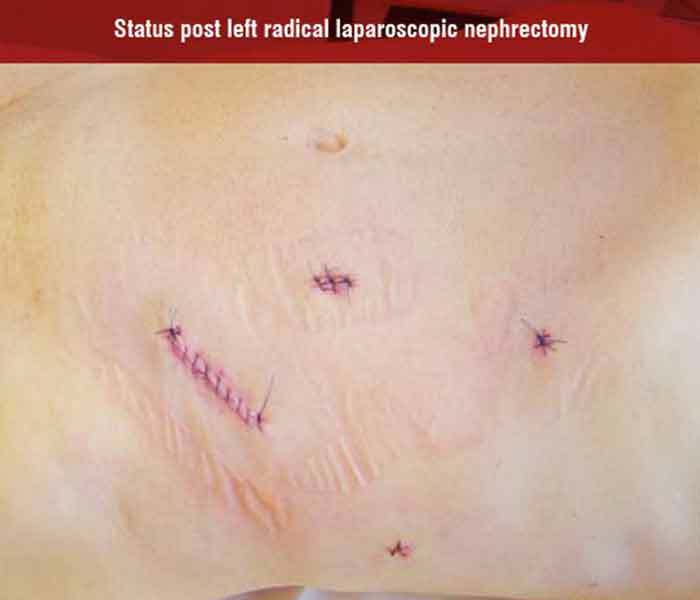 Successful and safe radical nephrectomy has a lot of conditions: skilled and patient surgeon able to convert the operation, skilled assistants and nurses and good technical equipment (bipolar instruments, vessel sealing systems or harmonic scalpel, staplers, clips with lock, endo-catch bag like a landing-net for fishes). Laparoscopic Partial Nephrectomy (LPN) has intermediate-term oncologic and functional outcomes (renal function) similar to those of open in experienced centres. The main advantage of LPN is miniinvasivity. But LPN has its disadvantages as well: It is still under development. LPN is challenging, is technically difficult, and needs a very skilled surgeon and long learning curve. There is a longer ischemia time, higher rate of complications, mainly hemorrhagic. Relatively good results are published by ‘centres of excellence’ only and the question is, what will be the results in everyday urological practice. At least in the first phase of introduction LPN to urological departments—only highly selected tumours can be indicated for LPN. Larger series with longer follow-up and prospective randomised studies are needed to confirm the safety and efficacy of LPN. In solitary kidney and in chronic kidney disease, open approach is a preferred method because in LPN, there is a higher risk of temporary or permanent dialysis after operation. Robotic-assisted radical nephrectomy is feasible, but today it has probably no substantial advantages. In robotic-assisted partial nephrectomy, learning curve is truncated, it is helpful mainly in complicate cases due to less difficult suturing in restrictive spaces (including tumour of upper pole inaccessible for regular laparoscopic instrument) and suturing is faster as well. The most important disadvantage is price of the robotic surgery. In laparoscopic surgery, it is recommended to know the topographic anatomy of renal vessels through biphasic CT angiography. This evaluation needs high-quality CT (MDCT) scanner. RadioFrequency Ablation (RFA) and cryoablation are used routinely only. Other techniques (HIFU, LITT, microwaves) are still rather experimental. RFA and cryoablation are applied percutaneously or laparoscopically. Percutaneous application is really minimally invasive. Laparoscopic application needs general anaesthesia of course, but it is technically strongly easier in comparison with LPN. But they are still not accepted for every-day practice; some of these methods can be labelled as experimental and can be recommended mainly for clinical trials. The main disadvantage: In situ destruction of tumours has a risk of residual tumour. Higher risk of residual tumour is in RFA (13,4 per cent) than in cryoablation (3,9 per cent). Due to this fact, cryoablation seems to be more reliable than RFA. Cryoablation is a very promising, safe and feasible technique with minimal morbidity, excellent shortterm efficacy. Compared to laparoscopic partial nephrectomy, laparoscopic cryoablation has some advantages. Less blood loss, it doesn’t involve hilar clamping and technically difficult reconstructive technique, it is easier to treat less exophytic tumours. But longer follow up is needed. Percutaneous cryoablation is still under development, monitoring is possible with MRI, CT and ultrasonography. Laparoscopic or percutaneous RFA has no imaging control of lesion during ablation, there was indentified viable tumours cell within treated lesion due to ‘skipping’ at vessels or tissue junctions (collecting system). RFA has a higher rate of local progression and metastatic progression compared to cryoablation. RFA at this time can not be recommended as a first line treatment modality in ablative techniques. Routine application of ablative techniques can be recommended only in highly selected cases (polymorbide patient—but they can be followed-up only, solitary kidney mainly with multiple tumours, m. von Hippel-Lindau—i.e. multiple bilateral tumours). We can not forget the broad spectrum of experimental methods—microwave therapy—nearly abandoned technique, HIFU, microwaves, lasers (LITT—Laser Interstitial Thermal Therapy, bloodless resections—to date mainly in animal models), one-port laparoscopy. One port laparoscopy is performed through the navel mainly, it needs special equipment—special port, articulating graspers end endo-shears and laparoscope with deflectable tip. It has a lot of synonyms (SPA—Single Port Access, SLIPP—Single Laparoscopic Port Procedure, OPUS—One Port Umbilical Surgery, E-NOTES – Embryonal Natural Orifice Transluminal Endoscopic Surgery). In animal experiments, scarless laparoscopy is applied (combination of transgastric and transvaginal or tranvesical or transcolonic approach). These techniques are not suitable for clinical practice to date. We can read as well first notes about using of microrobots working in abdominal cavity. It sounds to be fantasy, but can be a reality in the next ten years. There has been intensive discussion about the role of follow-up (active surveillance) instead of surgery or ablative methods (suitable mainly for tumours < 3 cm in polymorbide patients) and the role biopsy has in this connection. What is the foundation of this approach? There is negligible growth rates in vast majority of small renal masses (under 3 cm), rapid growth correlates with higher grade. Follow-up is an alternative mainly to the formerly mentioned percutaneous ablation techniques. With respect of facts said above, we can give the algorithm for treatment of kidney tumour under 3 cm. We have to add 2 important pieces of knowledge: over 20 per cent are benign and in renal cell carcinoma is poorly differentiated (grade 3) in less than 5 per cent. Preferred method is laparoscopic resection with following exceptions—tumour of upper pole (open resection), centrally located tumour (laparoscopic nephrectomy or open resection), moderate risk patient (percutaneous RFA or laparoscopic cryoablation) and high risk patient (follow-up only). New trends in surgery of kidney tumours for everyday praxis are followed: Indications for nephron sparing surgery are expanding to cT1b and centrally located tumours. Laparoscopic nephrectomy is the gold standard in cT1-2 and facultative in cT3a-b, cTXN1-2. In approach to partial nephrectomy, open surgery is still the gold standard. Laparoscopic approach is applied only in carefully selected patients. This method is more challenging, with a higher percentage of complications, however, it is getting popular. Robotic systems make laparoscopic partial nephrectomy easier. 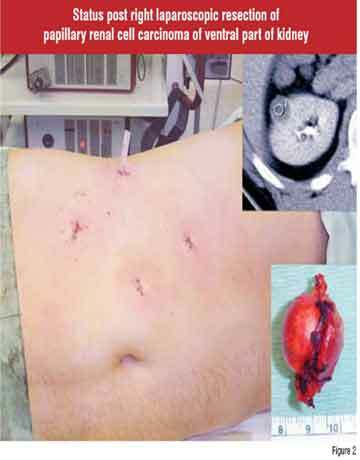 Laparoscopic or percutaneous in situ destruction are still experimental methods and are recommended only in highly selected cases or in clinical trials. Cryoablation is safer than RFA. High-risk patients with a tumour diameter under 3 cm can only be followed-up as well. 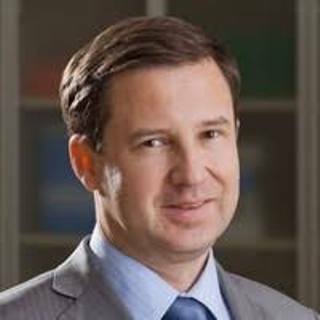 Hora Milan is the Associate Professor, head of department of urology in Charles University Pilsen, Czech Republic. He specialises in urooncology, mainly for kidney tumour and laparoscopy. He is also Editor-in-chief of the journal Czech Uroloogy.